The parish of “Gross Justin” (Great Justin) in Kreis Cammin, Pomerania, Prussia contained the towns of Kahlen and Stuchow, where the Krüger and Schwarz families came from (Caroline Krueger’s maiden name was Schwarz). 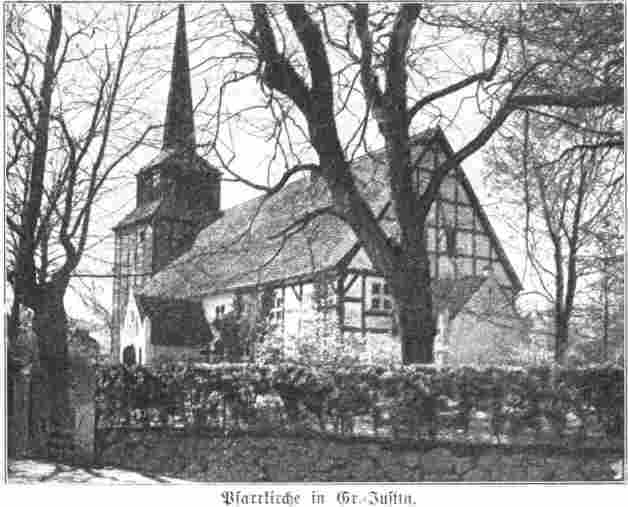 From 1839 , the majority of parishioners or church members in the parish of Groß-Justin converted to Old Lutheran, and in abt. 1850 they built a second church there. The half-timbered church in Great-Justin had a rich interior. After the Second World War, it fell into disrepair and was eventually demolished. There remain only ruins today. It’s very possible that the Krüger family (and Schwarz family) attended this church. The church at Gross-Justin in its prime. The fact that the parish was created by so-called “Old Lutherans” (more on them here), might be one reason the Krüger family emigrated to the US. Old Lutherans were persecuted during the 19th century in Prussia, and while this persecution was largely over by the 1880’s, the Old Lutherans were still marginalized compared to those who belonged to the Union Church. As I have written about previously, my 2nd great grandfather Wilhelm Schmidt (1862-1925) brought his mother and five sisters from Posen, Prussia to live in Marathon County, Wisconsin. Until today, I assumed that all five of the Schmidt sisters arrived in the US about 1892 or 1893, got married, and went about their lives. Some of the sisters got married (thus changing their names) and they and their children stayed very close to my relatives in Rothschild, Wisconsin. I have often lamented to my mother that, for example, Amelie Schmidt married Christian Karl and they settled down only a few blocks away from my family in Rothschild with their 10 kids. I’d never heard about “other Schmidts”, so I assumed that none of my family knew about the 10 cousins right down the street from them. Then tonight I was scanning documents and happened to open an envelope that my cousin Norma Wendorf Bandock had given me. Inside are a few items that belonged to my great-grandfather Edwin Schmidt (1888 – 1972). 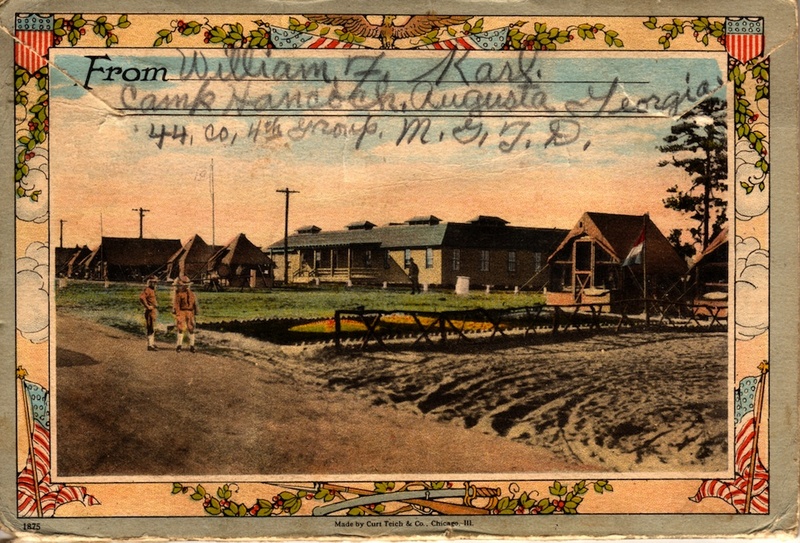 One of those items was a beautiful postcard sent on 14 July 1918 from Camp Hancock in Augusta Georgia. 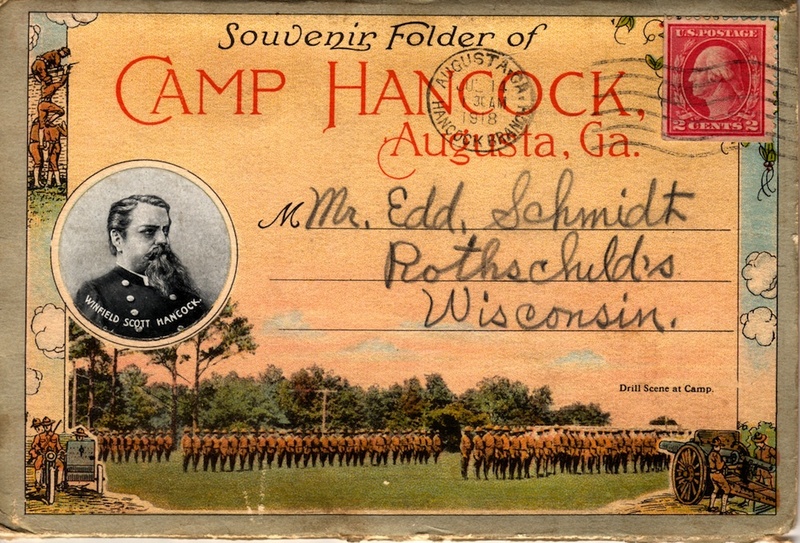 It’s a beautiful, color postcard/envelope containing many photographs of camp life during WWI. The first thing I noticed is that in addition to Christ and Amelia being born in Germany… so were both the boys. You also notice they are the same age, and that all four of them had immigrated from Prussia together. In fact, it turns out the two boys were twins. Both born on 20 June, 1891. The WWI Draft Cards both sons filled out shows that they were both born in “Posen, Germany” and both were paper makers at the Marathon Paper Mill at that point. 1930 Census for Los Angeles, CA District 6. So rather than coming to the US with her sisters and finding a husband, Amelia Schmidt was married to Christian Karl (in 1891 or 1892, per the various years given on the census reports) in Prussia. Based on the birth dates of the twins, I’m guessing very early in 1891. And then the two parents grabbed their one- or two-year-old twin boys and got on a boat to come to the US as a family. This gives us two more Schmidts who were immigrants to this country. Two that we didn’t know about previously. William and his twin brother Gustav both moved to Los Angeles by 1930, and both of them died in that city, William in 1960 and Gustav in 1975. Gustav had at least one son, Lloyd A. Karl. 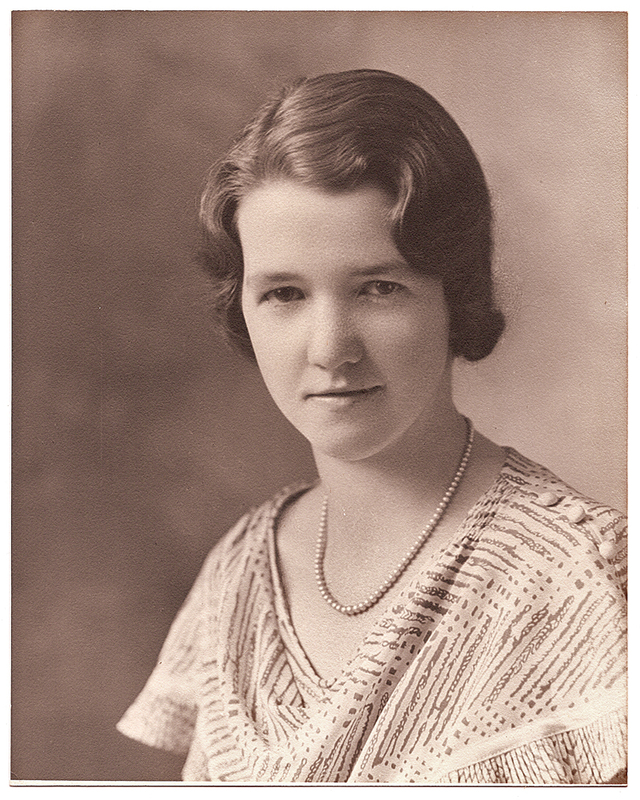 William had at least one daughter, Doreen L. Karl. I’m following up with both of them to see if we can locate any living relatives. Tom Forrest sent me this remarkable letter tonight from the scrapbook of Helen “Duffy” Forrest (his aunt, my grand-aunt). 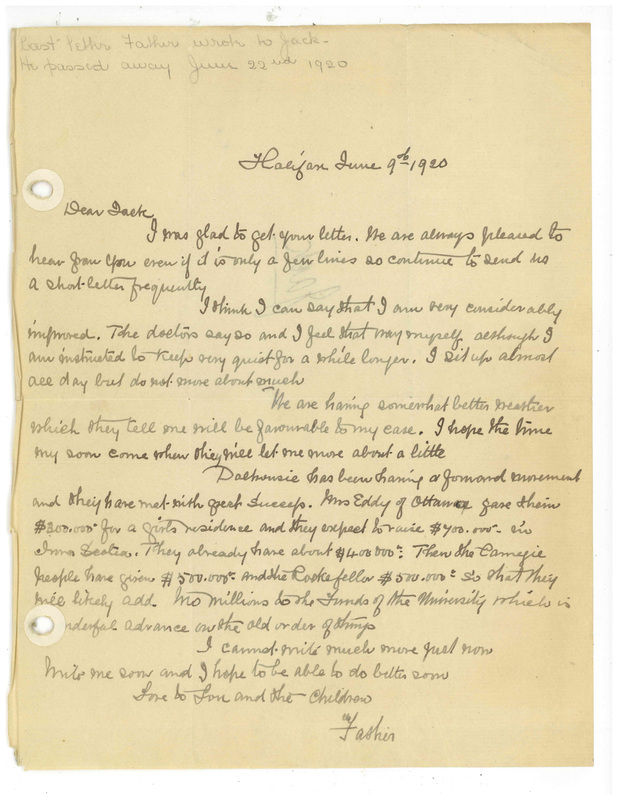 It was written on June 9th, 1920 by my 2nd great grandfather John Forrest, the president of Dalhousie University in Halifax, Nova Scotia, Canada, to my great-grandfather John Prescott “Jack” Forrest. The father died just two weeks later on June 22, 1920. 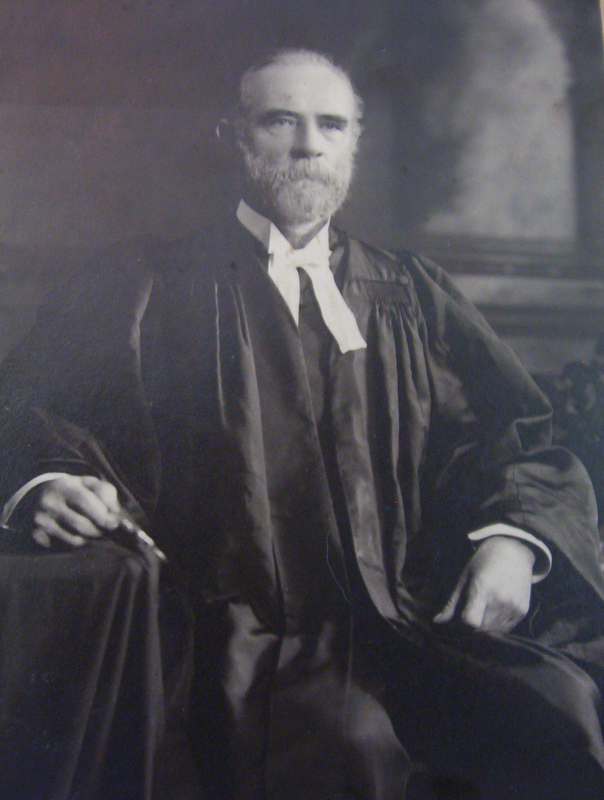 John Forrest (1842-1920), President of Dalhousie University. His son, John Prescott "Jack" Forrest. I don’t think it’s my imagination that the handwriting gets weaker at the end of the letter. It shows John Prescott to be an optimistic man, and concerned about his beloved University until the very last. I also really like how he refers to my great-grandmother Lulu as “Lou”. It’s very sweet. I am glad to get your letter. We are always pleased to hear from you even if it is only a few lines so continue to send us a short letter frequently. I think I can say that I am very considerably improved. The doctors say so and I feel that way myself, although I am instructed to keep very quiet for a while longer. I sit up almost all day but do not move about much. We are having somewhat better weather which they tell me will be favorable to my case. I hope the time may soon come when they will let me move about a little. Dalhousie has been having a forward movement and they have met with great success. Mrs. Eddy of Ottawa gave them $300,000 for a girl’s residence and they expect to raise $400,000 in(?) Irma Scalia. They already have $400,000. Then the Carnegie people have given $500.000 and the Rockefeller $500.000 so that they will likely add his(?) millions to the funds of the University which is a wonderful advance on the old order of things. I cannot write much more just now. Write me soon and I hope to be able to do better soon. I received a call this morning from a woman who works for Lakeview Cemetery in Burlington, Vermont. I had actually called her when I was trying to find out who the “Nettie M. Thomas” was in the wedding description I had posted here earlier. I have subsequently found out who Nettie was, and plan to write a blog about her life very soon. In the mean time, there was a small marker next to the graves of Joel Wells Thomas (1835-1916) and his wife Emma Burrows (1841 – 1910) that said “Nellie”. I thought it was possible that “Nettie Thomas” was this Nellie. (Just to place this family in context, Joel Wells Thomas is one of the sons of James Thomas, my 4th great grandfather. So he’s my 3rd great uncle. 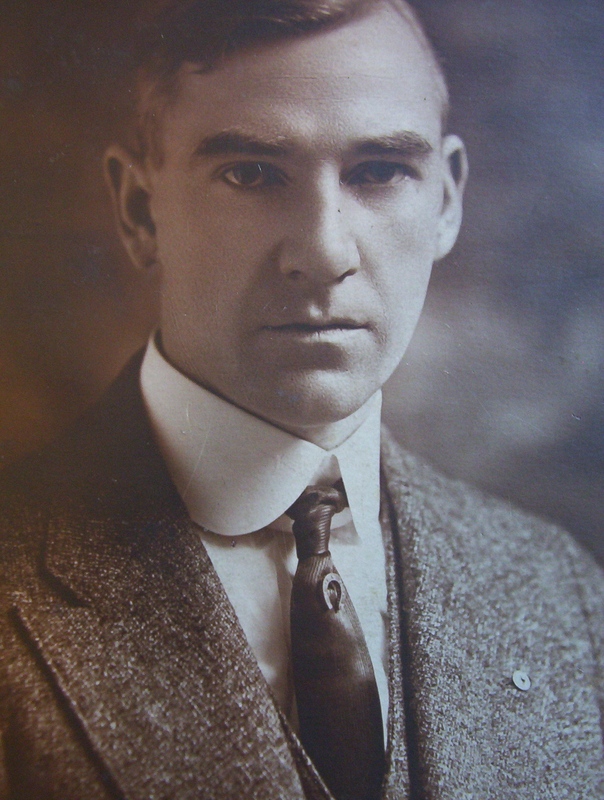 His brother Charles H.L. Thomas was my 3rd great grandfather. 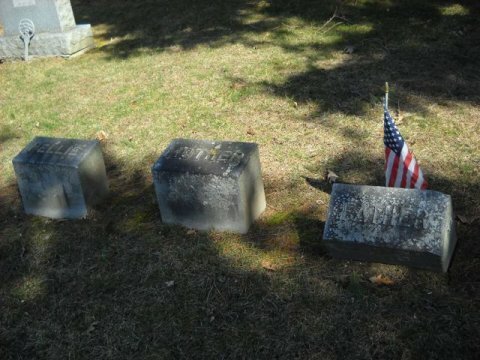 Joel Wells Thomas and Emma Burrows are the “Mother” and “Father” buried in the family plot. There is no main headstone there currently, only the footstones. She didn’t know if there had ever been a headstone or not. It’s possible it fell over and sank. The “Nellie” footstone is for Nellie M. Thomas, who died 11 Jan 1874 aged 2 yrs, 9 mos, 2 days. Nellie was originally buried in the South outline of Lot 11, which was owned by E.E. Wells. Interesting given Joel’s middle name. Nellie was re-buried in the Thomas family plot 13 Oct 1906. In addition to Joel, Emma, and Nellie there are notes indicating a “Will” and “Ralph”, but she could find no records of burials for anyone with those names. She said she will check the chronological records between 1862 and 1875 on the hunch that they could have been children who died very young. That’s about the time Joel and Emma seemed to be having children. The Thomas family plot at Lakeview Cemetery in Burlington, Vermont. 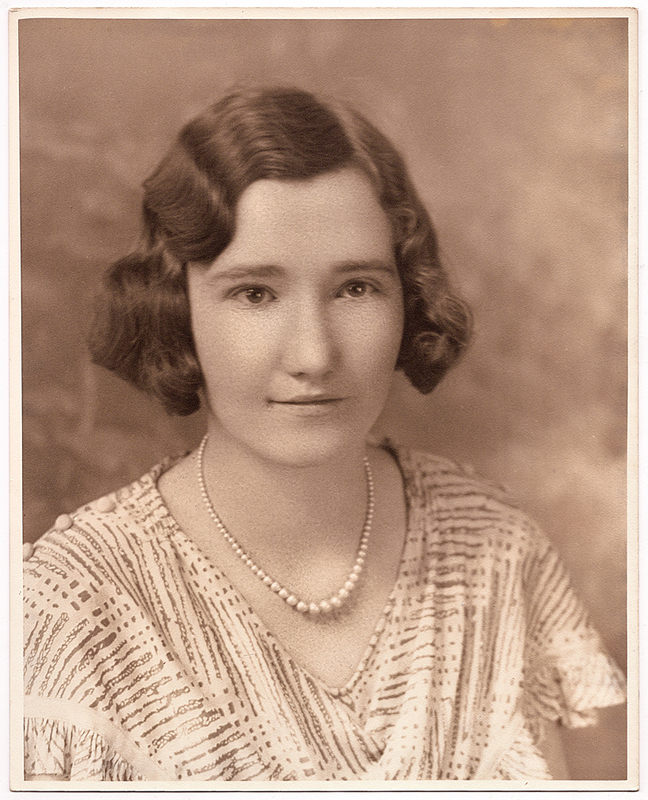 My father’s “Aunt Duffy”, Helen Duff Forrest (1913 – 1992). Another Tom Forrest photo, beautifully scanned. As he points out, Helen is wearing the same dress that my grandmother Mildred Jean Thomas was wearing in the photo of her I posted here recently. I rather like this photo of my grandmother and her sisters… especially the casual cigarette my grandmother is holding in her hand. 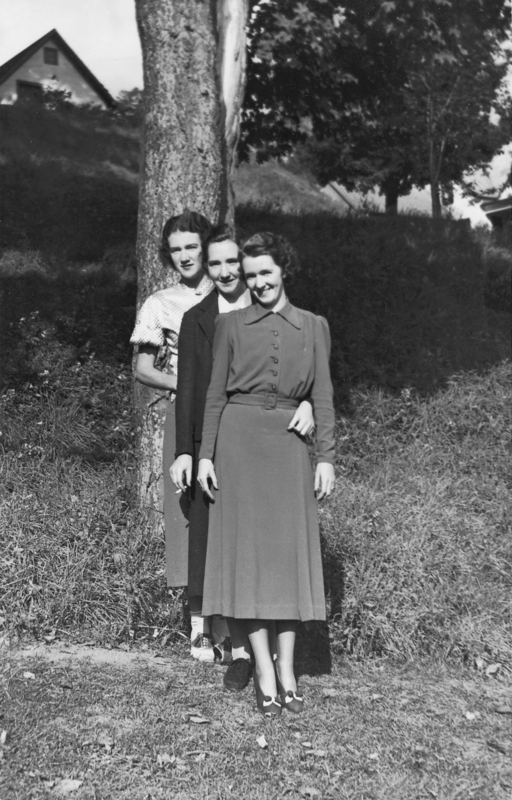 Betty, Mildred Jean, and Helen "Duffy" Forrest (front to back) about 1938 or 1940. As you can see from earlier posts, I have been researching Harriet S. Thomas and her husband Joel W. Celley. To that end, today I was working on researching her youngest daughter Sarah Celley. She married a man named George Washington Snow, but they seem to have split up shortly after getting married and having a kid together. I was shocked to discover that in 1912, Sarah (Sadie) attended the wedding of Elmer Loomis and Ethel Anderson, who are the grandparents of one of my cousins and research partners Nancy McGovern L’Ecuyer. I’m attaching the description of the marriage that I found tonight in the 5 Sept 1912 edition of the Saint Albans Messenger. The article is incredible for all the people it mentions! In addition to Elmer Loomis and Ethyl Anderson, it mentions father of the bride Charles H Anderson and his wife Amy M Thomas (she is Joel B Thomas’s daughter), Erwin T Anderson (brother of Charles), Roy E Anderson (the bride Ethyl’s brother), Miss Nettie M. Thomas (not sure yet, could be Nellie M Thomas, Joel Wells Thomas’s daughter), Sadie Snow (Sarah Celley, the daughter of Harriet S. Thomas whom I’ve been researching), Lemuel O Flint and his wife Lillie Thomas (also Joel B Thomas’s daughter), Emma May Thomas (Mrs. Wallace Howard, who is Horace Thomas’s daughter), and Nellie Maude Thomas (Mrs. Guy McKenney, also Horace Thomas’s daughter). Update: I believe that Nettie M Thomas from Providence, RI is Harriet S. Thomas’s first daughter, born about 1860, before her marriage to Joel W. Celley. She lives with various family members in the 1870 and 1880 Burlington, VT censuses, going first by “Nettie Thomas”, then “Nettie Celley”, then finally appearing in Providence, RI as “Nettie M. Thomas”. This proves that Harriet’s children had contact with the rest of the Thomas clan including Nancy’s family and my family directly! Description of the Loomis/Anderson Wedding from the 5 Sept 1912 edition of the Saint Albans Messenger.